‘Whole Product Approach’ as explained by Economist Theodore Levitt has been one of my favorite concepts. 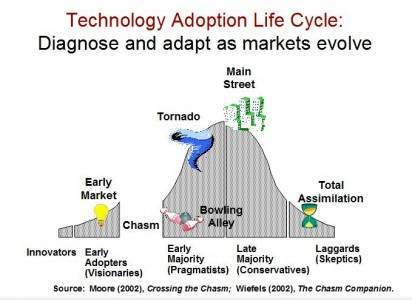 The concept was later familiarized by Geoffrey A. Moore through his book ‘Crossing the Chasm’. So it was kind of Déjà vu when I chanced to read an older article in ‘Accidental Product Manager’ blog. Though Dr. Jim Anderson does not explicitly talk about ‘Whole Product Approach’, all the activities such as location of stores, customer service, training manual, sales collateral etc that he was referring in his blog, encompass ‘Whole Product Approach’ and those activities are critical for the success of the product. I initiated this blog to figure out the right constituents of ‘Whole Product’ during each phase of the Technology Adaption Lifecyle. I refer to the ‘Whole Product’ as the sum of core product and its add-ons such as location of stores, manuals, installation guides, and after sales service etc. The list of add-ons differs according to the product and the industry. For instance in smartphone segments, availability of apps forms the critical component of add-ons, whereas in automobile sector after sales services, dealership networks forms the critical part. Universal truth is that we could not focus on every element of the product and its add-on in version 1.0, so in Product 1.0 we should only focus on critical elements of the core product and its add-ons that would provide a compelling reason for the target customers to buy the product. Invariably with exception of few products like Windows most of the products follow the technology adaption lifecycle and hence the target customers for Product 1.0 are Innovators and small chunk of Early Adaptors. So we have to initially focus on their requirements when we attempt to form the constituents of ‘Whole Product’ and as the product threads the subsequent paths of technology adaption lifecycle, the constituents of ‘Whole Product’ varies according to the expectations of each category. Now let us to try understand how to arrive at the constituents of ‘Whole Product’. To do so, I would primarily list down all the elements of ‘Whole Product’ in the form of matrix as listed below. Against each of those elements, we have to indicate in % values how much each category would value the core products and its various add-ons relatively. Higher % value against any element indicates that it is a stronger influencer to sell the product and therefore should be focused. For instance, Innovators value the core product much higher than any other element. So in product 1.0 there should be lots of emphasis on the core product and its ability to solve customers’ pain points in more unique and optimal way. Within the core product, lots of features will be competing to find a place in 1.0. The features should be prioritized depending on its ability to solve the critical pain points. As the product is embraced by other categories, the emphasis will slowly switch from the core products to add-ons. Detailed discussions with the respective target audience will help us fill the matrix and facilitate us to constitute the essential add-ons that would increase the Whole Product experience. The success of this approach is largely dependent on our ability to successfully trace in which phase of the technological adaption life cycle is the product currently positioned. As far as i am concerned, i am still trying to figure out how long product will remain in each phase when exactly the product will move from one phase to another. My quest to learn more continues, if i could figure out anything substantial i will draft another blog post.